Modern elegance, the gorgeous Vanita features a wide set off the shoulder collar with additional embellished straps in our stunning corded floral Aztec lace. The structured fitted silhouette is fully adorned with beads, pearls and crystals falling into a small train through the back, closure is a simple invisible zip. 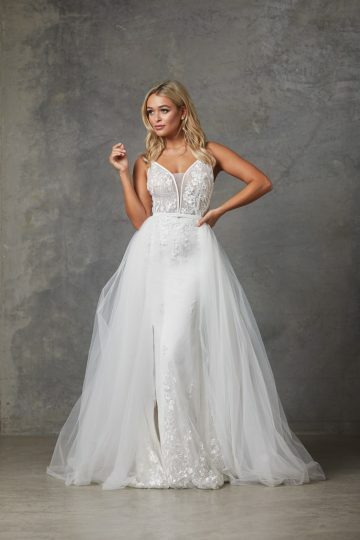 Enchanting, the Vanita Beaded off Shoulder Wedding Dress is based over a stretch lining allowing you to get the fitted look and movement each bride desires. The gowns cut and design is flattering to a variety of shapes and sizes (6-24). To identify your size see your nearest Tania Olsen Designs stockist and they will correctly measure you and assist with selecting your size.